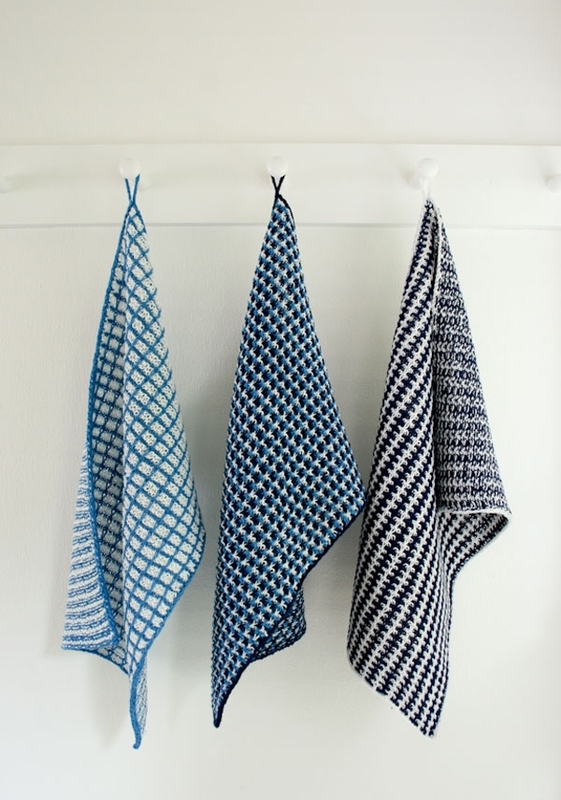 These dishtowels look really complicated to make, don’t they? I love that because, just like you want hard things to look easy, it’s a great coup to make easy things look difficult! 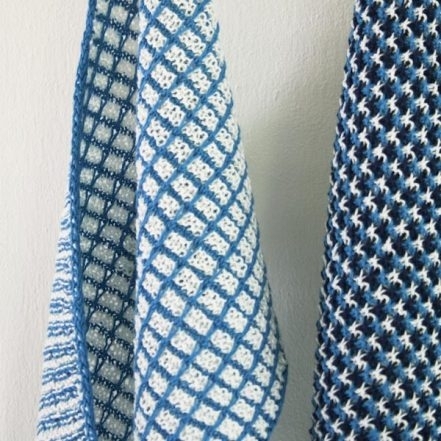 These three stitch patterns all come from Barbara Walker’s classic Treasury of Knitting Patterns and are created by the simple technique of hiding yarns behind slipped stitches. 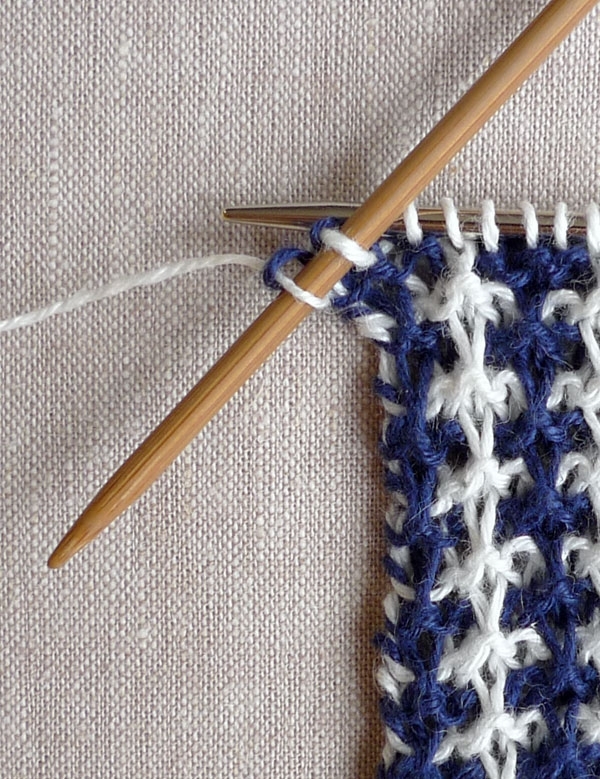 There’s no tricky stranding or two-hand knitting or even issues of tension; there’s just the easy matter of slipping stitches and watching as amazing patterns emerge! Slip stitch color patterns are terrific for scarves (check out Laura’s gorgeous Reversible Stripes Scarf), sweaters, blankets and even dishtowels. For these, I looked for patterns that would evoke traditional kitchen textiles: no-nonsense designs with the geometry of vintage linens. 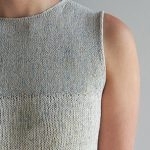 And for a yarn that would match these hard-working stitch patterns I chose Louet’s Euroflax 100% linen. As tough and absorbent as any fiber around, linen is a great friend to have over your shoulder when you’re cooking up something good! In our Cotton Pure, these Dishtowels are a bit hefty and a lot soft. They’re also absorbent and totally beautiful! For more information and additional photos, be sure to check out our new post! Note: This is enough yarn to make these three dishtowels plus one more. 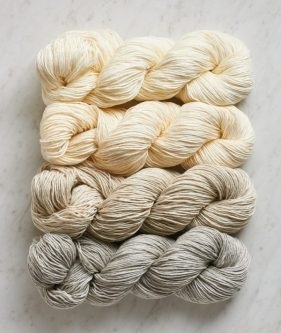 When changing colors, carry the new yarn up the selvedge in front of the old yarn. 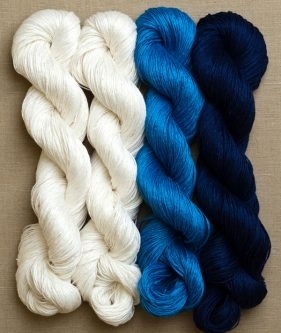 In this photo the Navy yarn is the “new yarn” about to knit the first stitch. With Color A, cast on 75 stitches. Row 2 (right side): With Color C, k3, *slip 1 with yarn in back (wyib), k3, repeat from * to end of row. Row 3: With Color C, slip 1 wyib, k2, *slip 1 with yarn in front (wyif), k3, repeat from * to end of row. Row 4: With Color A, k1, *slip 1 wyib, k3, repeat from * to last 2 stitches, slip 1 wyib, k1. Row 5: With Color A, slip 1 wyib, *slip 1 wyif, k3, repeat from * to last 2 stitches, slip 1 wyif, k1. 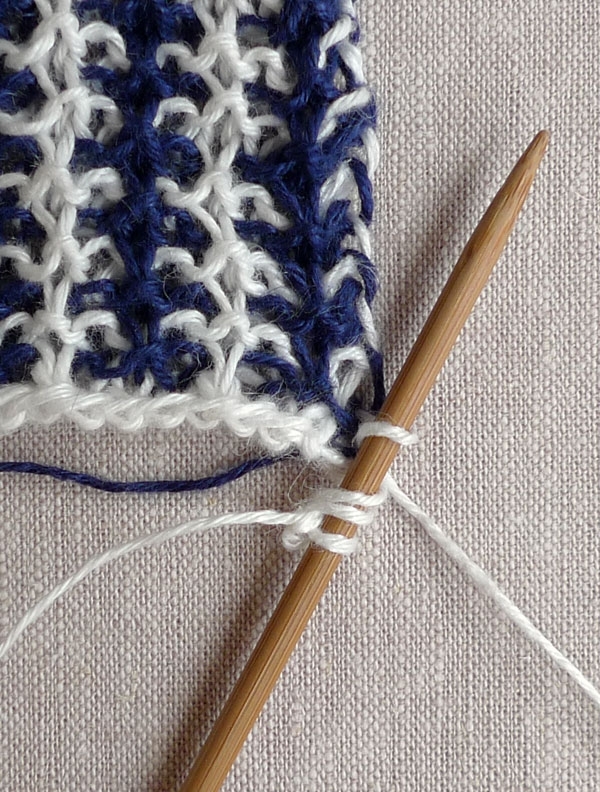 Repeat Rows 2 – 5 until piece measures 17 inches, ending with a Row 3. Next Row (right side): With Color A, knit to last 2 stitches, k2 onto a double pointed needle. With the right side facing you, work an I-cord on those last 2 stitches until the cord measures 3 inches from its base. Work the last row as a k1, slip 1 wyib, yo. Now starting at the base of the 3-inch I-cord, work an Attached I-cord down the left selvage. 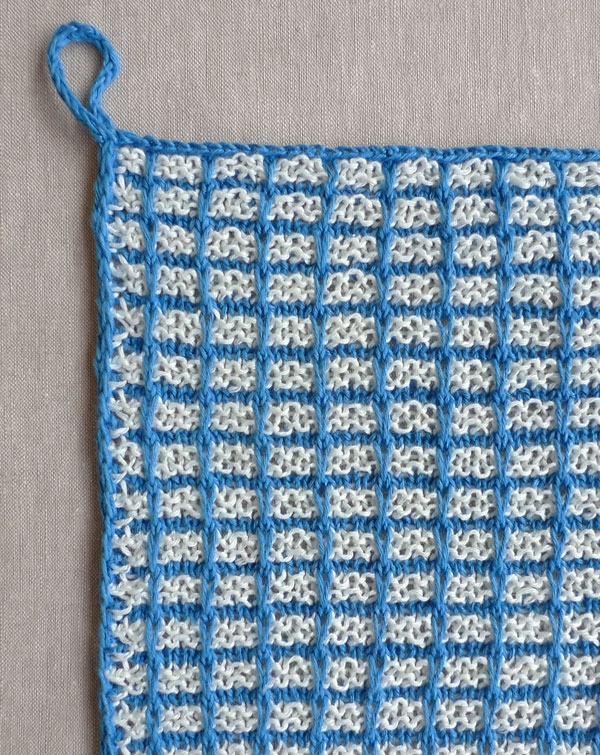 Pick up 1 stitch for every 4 rows (which means picking up 1 stitch at either every Color A or every Color C stripe) until you reach the bottom corner. Pass the first stitch over the second, cut the yarn and pull it through the remaining stitch. Now, with Color A, cast 2 stitches onto a double pointed needle. K1, slip 1 wyib, yo and with right side facing, pick up a stitch in the bottom right corner. Work an Attached I-cord up the right selvage to the top corner. 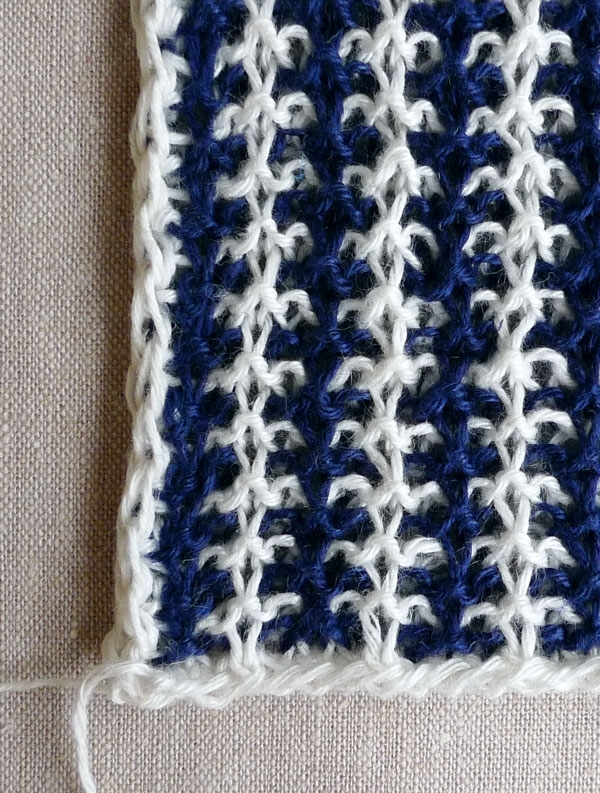 Knit 1 row of a regular, unattached I-cord, then pass the first stitch over the second so that 1 stitch remains. 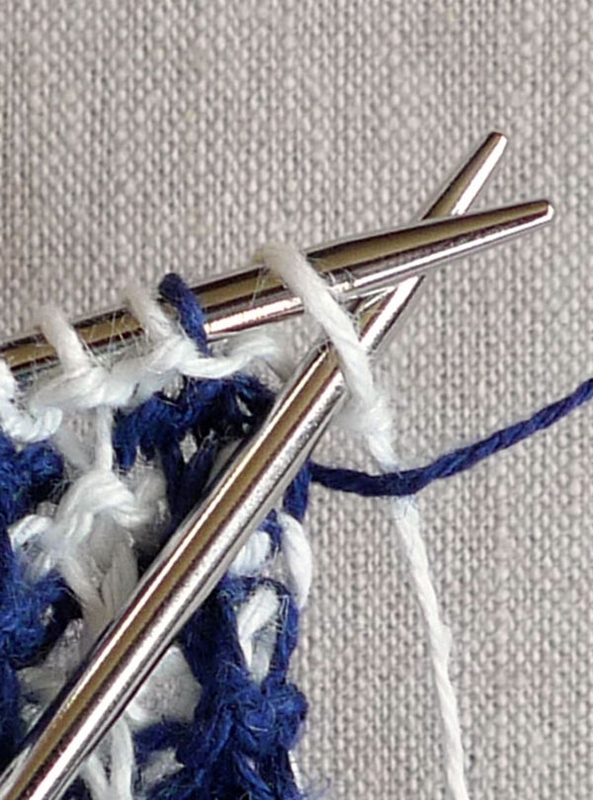 Using the double pointed needle with 1 stitch on it, knit the first stitch that is on the circular needle and bind off. Continue to bind off all the stitches that remain on the circular needle. Cut the yarn and pass it through the remaining stitch. Weave in the ends and block your new dishtowel! With Color B, cast on 71 stitches. Row 2 (right side): With Color A, k3, *slip 1 with yarn in back (wyib), k3, repeat from * to end of row. Row 3: With Color A, slip 1 wyib, k2, *slip 1 with yarn in front (wyif), k3, repeat from * to end of row. Rows 4 and 5: Repeat Rows 2 and 3. Row 7: With Color B, slip 1 wyib, purl. 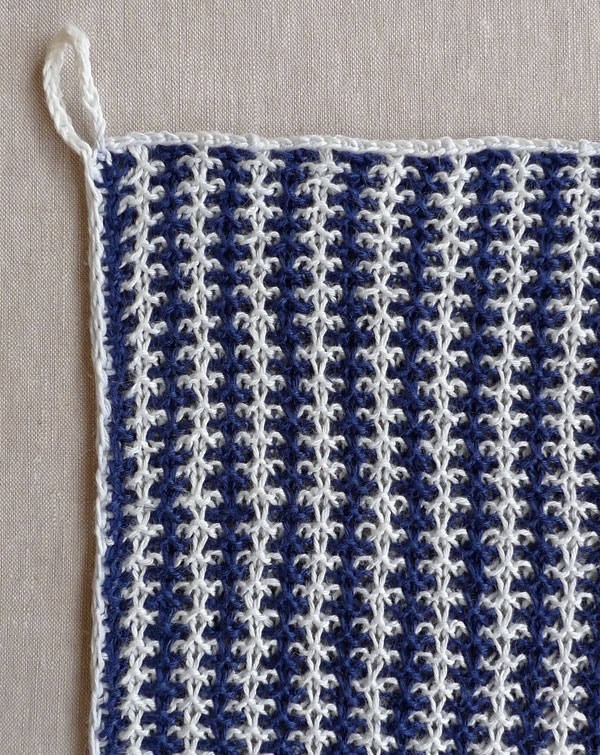 Repeat Rows 2 – 7 until piece measures 17 inches, ending with a Row 5. Next Row (right side): With Color B, knit to last 2 stitches, k2 onto a double pointed needle. 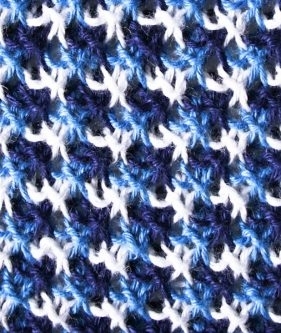 Using Color B, follow the finishing instructions as for the Three-and-One Tweed, above, except, for this stitch pattern, pick up 2 stitches for every 6 rows (which means picking up 2 stitches at the Color A stripes and skipping the Color B stripes). With Color C, cast on 76 stitches. Row 2 (right side): With Color B, k3, *slip 1 with yarn in back (wyib), k2, repeat from * to last stitch, k1. Row 3: With Color B, slip 1 wyib, k2, *slip 1 with yarn in front (wyif), k2, repeat from * to last stitch, k1. Row 4: With Color A, *k2, slip 1 wyib, repeat from * to last stitch, k1. Row 5: With Color A, slip 1 wyib, *slip 1 wyif, k2, repeat from * to end of row. Row 6: With Color C, k1, *slip 1 wyib, k2, repeat from * to end of row. Row 7: With Color C, slip 1 wyib, k1, *slip 1 wyif, k2, repeat from * to last 2 stitches, slip 1 wyif, k1. Cut Colors A and B. Next Row (right side): With Color C, knit to last 2 stitches, k2 onto a double pointed needle. Using Color C, follow the finishing instructions as for the Three-and-One Tweed, above. 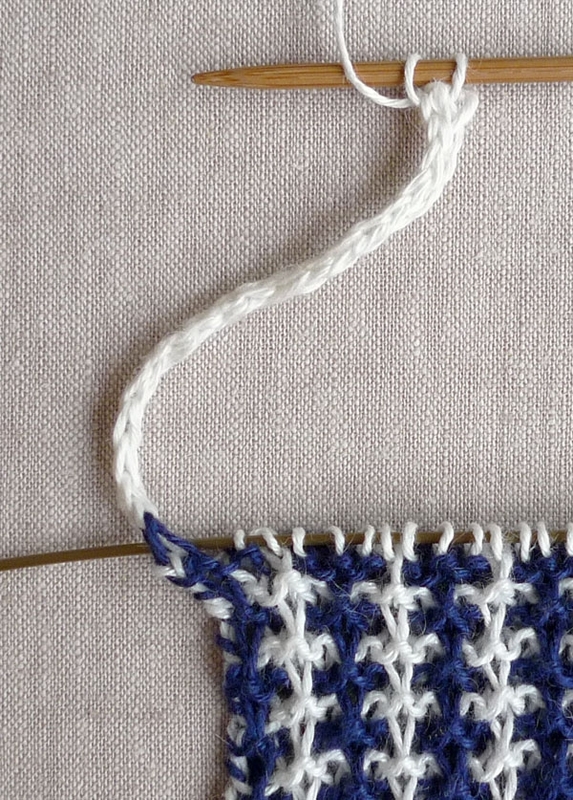 Pick up 1 stitch for every 4 rows (which means picking up 1 stitch at every other stripe of color). I want to make placemats in this design. How can I adapt this pattern for placemat size? Thanks for your gorgeous web site! Thank you for writing in and for your kind words! The first step in adapting this pattern would be to decide what size you would like your placemats to be. 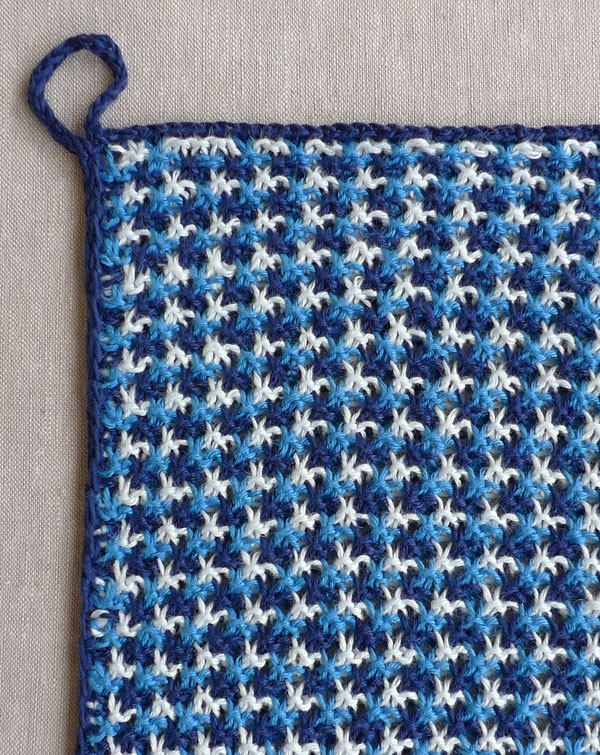 After you have decided on your measurements you will knit a gauge swatch to see how many stitches per inch you are getting. Once you have this information you can decide you your cast on number and then knit until it is the desired length. When deciding on a cast on number you will want to note that the Three-and-One Tweed and the Basket Stitch, a multiple of 4 plus 3; and for the Triple L Tweed, a multiple of 3 plus 1. great!! I can hardly wait to get started! thanks a lot! I am a fairly new knitter and have enjoyed this project so far. I am trying to finish the Triple L Tweed but I am really confused about the Icord and following K1, SLWYIB, YO sequence followed by an attached I cord. Basically the entire finishing section. Any suggestions? Thanks for writing in! I am sorry to hear that the finishing section is causing you difficulties. If you could clarify what type of problems you are having, I’d be happy to try to help you figure it out! I, too, do not understand the attached icord instructions. I was able to make the 3 inch icord. But I don’t understand the attached icord. It doesn’t seem similar to other attached icord instructions. Could you explain in more detail, perhaps getting us through 3 or 4 rows? Thanks. Knit 1, Slip 1 with yarn in back, Yarn over, pick up one stitch, then take the slipped stitch and the yarn over and pull both of those stitches over your picked up stitch and off the needle. 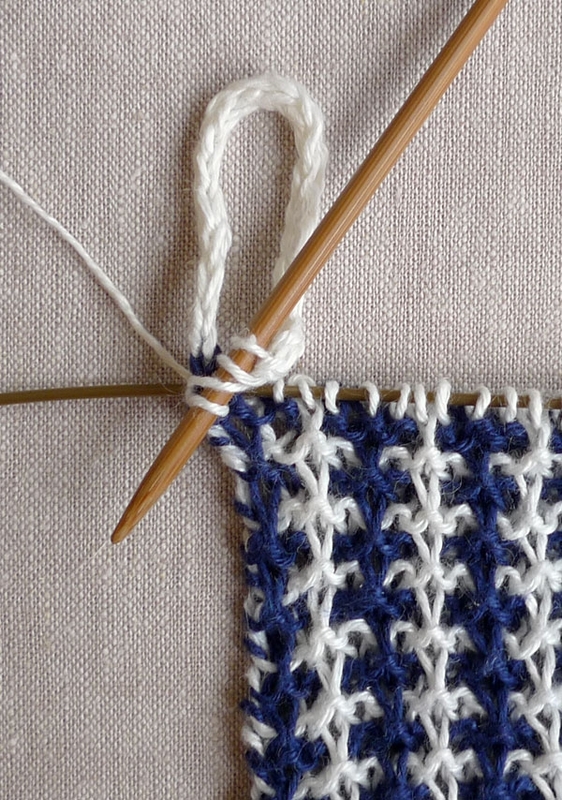 Or cast off both the slipped stitch and yarn over over your picked up stitch. You then slide your stitches to the other end of your dpn and start from the beginning again. I am a fairly new knitter and do you have a visual tutorial for changing colors multiple times when knitting an item? Thanks for writing in! Other than the photos on this page we do not currently have any visual tutorials for these stitches. Is there a particular part of this pattern that you are stuck on? I hope I can help! I love this bundle of colors and the pattern. What would be the math if I wanted to make these slightly smaller. I see you cast on 75. Would the pattern work if I casted on 50? Thank you for your question! When deciding on a cast on number you will want to note that the Three-and-One Tweed and the Basket Stitch, a multiple of 4 plus 3; and for the Triple L Tweed, a multiple of 3 plus 1. So if you want to knit the Three-and-one Tweed I would cast on 51 (4 x 12 + 3 = 51). 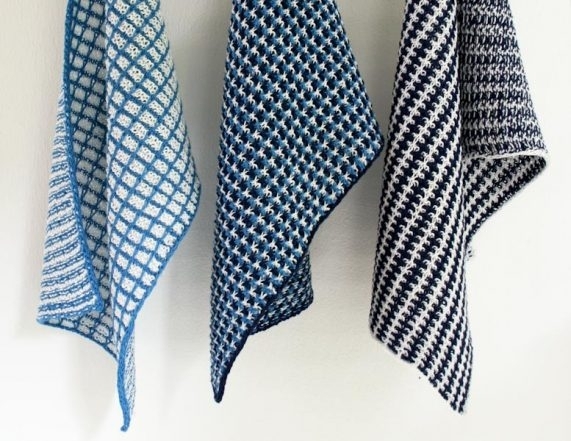 I am wondering — if you have blocked your dishtowel after you have finished knitting it, do you then also need to block it each time you wash it? Should you line-dry it? Thanks for writing in! We did block these lovely dishtowels! You can put Euroflax in the washer AND dryer. If you do, it just get softer and softer! As to whether you will need to block them each time, I would not think so. Washing and drying them should result in them looking just fine! Does anyone besides me have great difficulties printing your free patterns? They always seem to print extra text, on top of the parttI really want to print. I don’t want to print everyone’s comments… just the pattern, please. Thanks for writing in! We have a print function that will allow you to print as little or as much as you would like in the way of photos and the patterns. Is there an option to print without photos? It’s an awful lot of paper for a simple set of towels. Thanks for writing in! We certainly do have a print option that will allow you to print as little or as much as you would like. If you’re on a desktop version of the site, you will find a “print” icon in the right column just below the date and tags. If you’re on a mobile version of the site, you will find a “print” icon below the pattern and above the comments. Malheureusement, nous avons seulement les patterns en anglais. Merci pour votre demande! I have the same question as Meagon from 7/24/2017. I am trying to finish the Triple L Tweed but I am really confused about the Icord and following K1, SLWYIB, YO sequence followed by an attached I cord. Do I do the K1, S1WYIB and YO with the two stitches? Thanks for writing in! You will work the K1, S1WYIB and YO with the two stitches of the i-cord. This will feel a touch weird as you are working the YO with no stitch after it. Just hold the YO in place and starting at the base of the 3-inch I-cord, work an Attached I-cord down the left selvage. The picture below the K1, SLWYIB, YO instruction should give you an idea of how you will hold these stitches and insert the needle into the base of the i-cord to begin working the attached i-cord. Have you any hints on working out the chart or written pattern if you have a picture of a finished item? I can chart what it “looks like” and understand I think about repast plus some, about knitting forward from the pattern/chart and working back according the what the sts on the needle tell you, but despite having knotted two other squares in mosaic from Rowan KAL thru Martin Storey I am not doing well. It don’t think its yarn and needle size issues. This should graph as a quadrifoil with centre hub each 3×3 with a single centre stitch. with horizontal and vert boundaries and little arms nudging into the spaces. I have seen it as a finished item but not as a chart or written instructions. I sketched it with the wearers permission, we did not share a language, and I have no photo. Hope you can help. 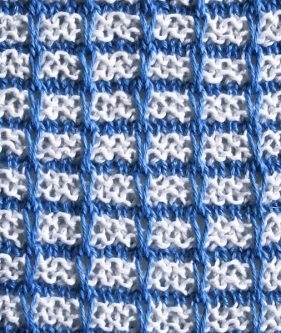 It maybe to knit it it need the underlying core grid to be 4×4 not 3×3? What a project! At present we do not have any tutorials that I can point you to for charting a pattern from a finished item. There are some books that I find helpful when designing sweaters and stitch patterns. Barbara Walker’s excellent stitch dictionaries contain a wealth of written stitch patterns from the simple to the very complex. 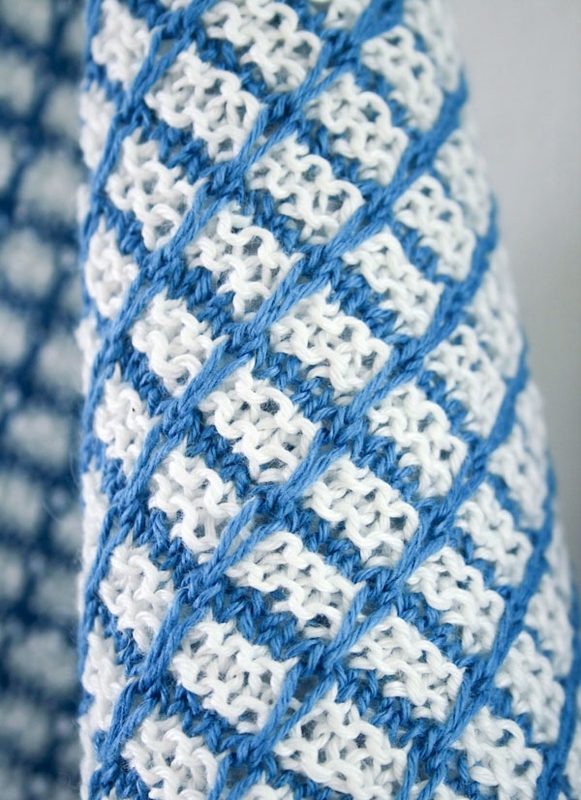 And Ann Budd’s books are always a go to for basic pattern and pattern construction! I am sorry that we could not be of further help! Best of luck on your project! I would like to make a baby blanket with this yarn and he basket pattern. Can you suggest a cast-on number of sts or what the multiple is for calculating that? Also the yardage for 2 colors? Thanks for writing in! What a great idea! This would make a lovely blanket! 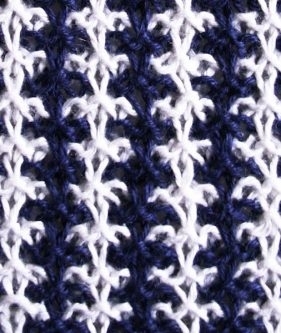 The Basket Stitch pattern works over a multiple of 4 stitches plus 3 stitches. For this particular pattern we used roughly half of each of 2 skeins of yarn for a 11 1/4 x 17 1/4 inch dishcloth. 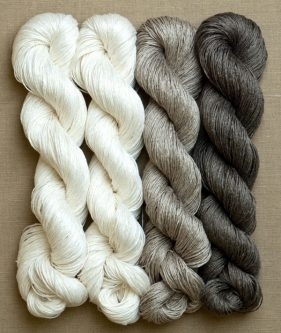 So if you would like to make a blanket that is 34 x 22 inches, you will need 2 skeins of each color. If you would like to make your blanket larger, we would be happy to help you figure out the correct yardage! I am a fairly new knitter. I would like to try these dishtowels but not sure which needles to purchase. Which length of circular needles would you recommend? And bamboo or metal? Thanks for writing in! What a lovely project to try! I would suggest 20 or 24 inch needles for this project would probably work best! As to bamboo or metal, that is very much a personal preference. I will say that metal needles can be a bit more slippery than wood. I generally prefer metal but when working with linen, which can be more slippery than wool, I tend to use bamboo as it grabs onto the linen and helps you keep the work on the needles. However, this is just personal preference and you may find that you prefer one over the other. Both will work well here! I love these dish towels! I have a question about the attached I-cord sides. I have done one side so far and it seemed to be so tight that it kind of shortened the length of that side of the towel, I even changed to a larger size dpn (which did seem to help a little) … I hope that makes sense. Is this normal or should i try something different? Thank you!! Thanks for writing in! It seems like your tension might be a little tight for the I-cord edging. I would continue sizing up your needles until you find a size that loosens up your gauge! I was thinking of using all my remnants of cotton wool to make a towel. Over the years I made many dishcloths and I have lots of leftover wool. I love your patterns for these dish towels. 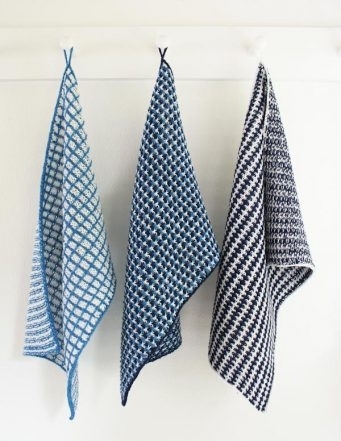 These dish towels are so beautiful! Would this pattern and yarn work as a set of dishcloths (for washing/scrubbing dishes, etc). Thank you for writing us! Yes, I think this would work great as a set of dishcloths. I love the slip stitch towel look. However, I never found the pattern. Went to said website. Just a lot of talk about the towel and tips., just no pattern. Thanks for reaching out! I am sorry to hear that you are having difficulty! 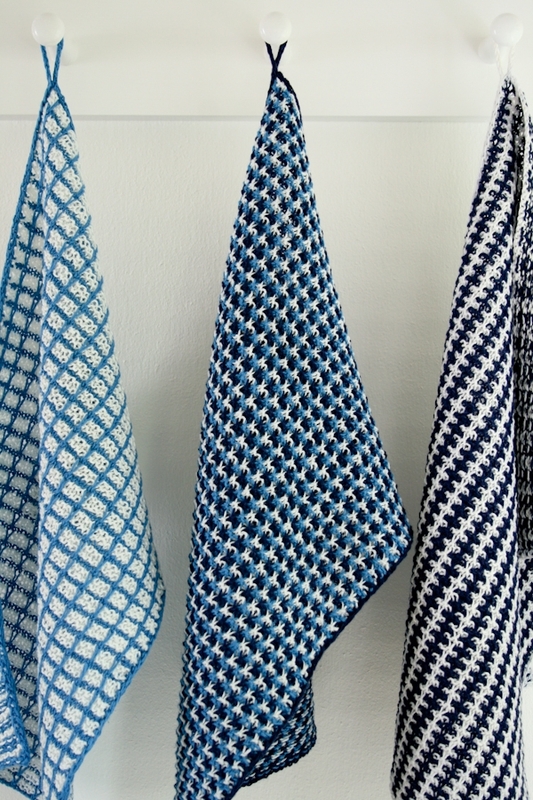 The patterns for these lovely dishtowels are located on the top portion of this page! If you would like to print them out, you can do so using out handy print function! If you’re on a desktop version of the site, you will find a “print” icon in the right column just below the date and tags. If you’re on a mobile version of the site, you will find a “print” icon below the pattern and above the comments. Thank you for reaching out! 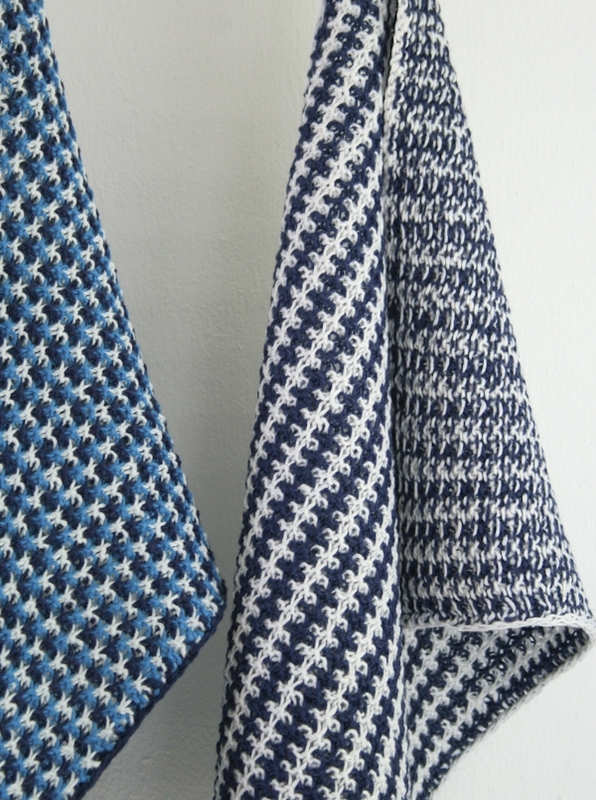 For these lovely dishtowels you will be carrying your yarn up as you go. I hope this clarifies things for you and let us know if you have any further questions! Thank you for reaching out- this sounds like a great idea! You do not cut the yarn, but rather carry the yarn up along the edge of your knitting. When changing colors, carry the new yarn up the selvedge in front of the old yarn. In this photo the Navy yarn is the “new yarn” about to knit the first stitch. Above, in the pattern, is a photo that illustrates what this looks like. I’d like to make these towels in a smaller size. 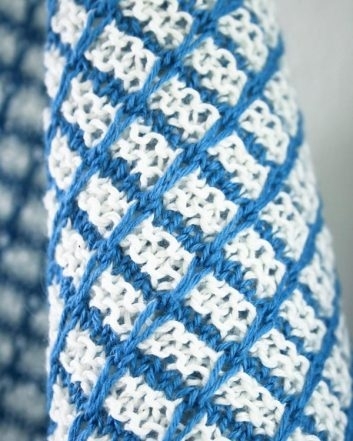 Could you tell me what multiples you use for each of them so I know what number of stitches to cast on, but keep true to the pattern. I’m afraid I’m having a hard time working it out from the patterns. Thanks for reaching out! For the Three-and-One Tweed and Basket Stitch patterns you will need to cast on a multiple of 4 plus 3, and for the Triple L Tweed, a multiple of 3 plus 1. Hello! The Eurflax link is broken: https://www.purlsoho.com/euroflax.html. 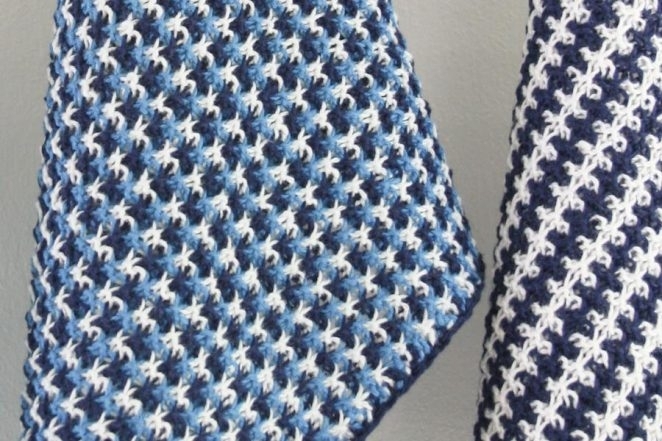 I am a knitting newbie and would really like to try these towels but don’t know what yarn to get. Can you advise? Thanks! Thanks for reaching out! Unfortunately we no longer carry Euroflax, which is why the link is no longer working. 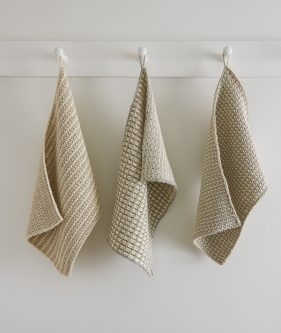 However, our Field Linen would be an excellent yarn to substitute for these dishtowels! It knits up to just about the same gauge as Euroflax but has a bit more yardage, so you will need the same number of skeins.